Previous message: Dave Zachariah: "Re: [OPE-L] "Levels of abstraction""
A while ago, I posted a thread on the Russian State Archive of Social and Political History, RGASPI. I follow up this thread with a picture of the building that might be of interest. This is the front of the building facing the street. 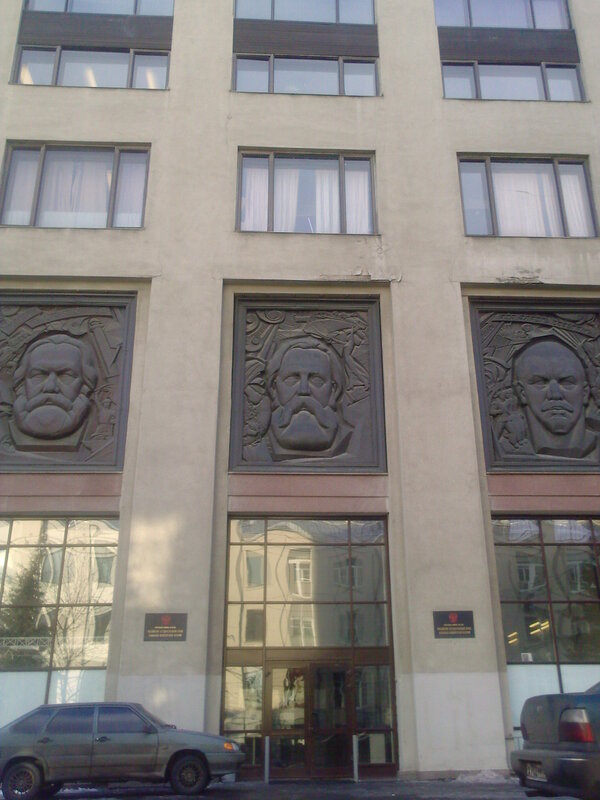 On the other side of the street are some luxury shops, because the archive is located in central Moscow. You get an idea of the size of the Marx, Engels and Lenin constructions if you look at the cars. The house was built by German POW:s in the late 1940s. It contains all the files from the former MEL-institute which was closed in 1991, but to my knowledge it doesn't have any exmployees working on the available material. Researchers have unlimited access to the majority of these files however, for no fee. Archivists there are very kind and helpful, and they often know many details about the materials. This is a gold mine for researchers in political economy and labour history, because there are hundreds of files on European labour history and the social sciences made available since the beginning of the Russian archival revolution in 1993.